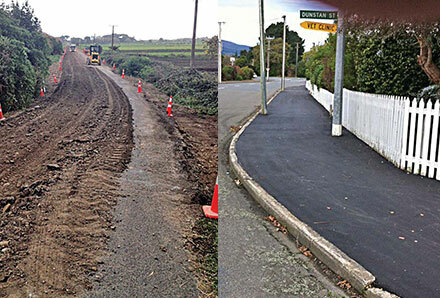 Council’s annual footpath upgrade has seen roads in two areas of Ōtaki improved. The footpath in Waerenga Road has been upgraded with a smooth bitumen surface. The sections completed were from State Highway 1 to Maire Street and from Aotaki Street to number 31 Waerenga Road. Plus a much more extensive “area wide treatment (AWT)” was completed in Swamp Road. This road is built on peat at a depth of approximately 800mm and therefore has settlement issues. It was uneven and made for a bumpy ride for vehicles. To remedy this Council contractors first ripped off the existing seal using a tractor-mounted hoe, in order to prevent water sitting between layers under the roading surface. A 100mm layer of aggregate (AP65) was then put down as a first course, which was graded and rolled. This was followed by a 150mm layer being stabilised using a 21-tonne machine. The 150mm layer was hoed and a 1% cement mix added to provide a new flexible high-strength pavement. This was rolled and graded and the final touch was a two-coat chip seal applied as the waterproof layer to complete the job.